Yolo County is offering up some must see holiday festivities this season! The California Agriculture Museum has lit up its tractors for the holidays! Get into the holiday spirit and celebrate our communities’ agricultural heritage at this year’s Twinkling Tractors, on display from November 11th to December 31st. See the tractors free with regular museum admission—visit our events calendar for more information. Join the holiday fun at the Davis Arts Center Annual Holiday Sale! More than just a holiday market with over fifty quality gift and food vendors, the Annual Holiday Sale also hosts a “Secret Store” for children ages 3-12 to choose and wrap gifts (gift prices range from $1-$8) and Paint-A-Plate station for all ages to decorate their own plate or mug for the holidays. Don’t miss out on this lovely holiday tradition—more details can be found at Davis Arts Center. Eat and drink your way through the holiday season at the Old Sugar Mill with Holiday Weekends! Experience four weekend-long events featuring food trucks, musical performances, cooking demonstrations, and of course, delicious wine tastings! Visit the Old Sugar Mill for more information. Experience the magic of this quirky, small-town festivity as local farmers light up their tractors for the holidays and cruise down Main Street for the annual Downtown Winters Tractor Parade and Tree Lighting. Following the parade, the City of Winters and Discover Winters Board of Directors will light the community tree with Santa in Rotary Park. Visit Discover Winters for more information. Join the Winters Friends of the Library on December 2nd 10 a.m. to 2 p.m. for a fun-filled holiday-themed festival at the Winters Community Center. Enjoy Christmas carols, make-and-take crafts, and a visit with Santa while celebrating the library this holiday season. For more details, visit the Winters Friends of the Library. Celebrate the holiday season alongside the Woodland community at the 53rd Annual Woodland Holiday Parade! One of the largest holiday parades in Northern California, watch over 175 dance and musical groups, ROTC units and festive floats at this year’s festivity. Visit the Woodland Chamber of Commerce for more details, or click here to view the pdf event program. Bring the kids along to see Santa at the 11th Annual Santa Sunday at the Yolo County Historical Museum’s Gibson House. Don’t miss the hot chocolate and make-and-take crafts—more details can be found at Gibson House. Santa Claus is coming to town! On December 8th, head on over to the Woodland Opera House to snap magical family photos with ol’ Saint Nick. Visit the Woodland Opera House for more information. 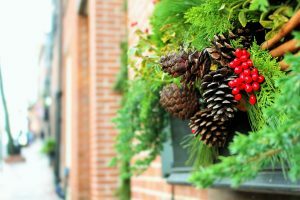 Get into the holiday spirit by visiting the award-winning Davis Farmers Market every Saturday in December for holiday music and make-and-take crafts. Look out for the “Gift Basket Central” station to grab your perfect gift! Visit Davis Farmers Market for more information. Create lasting holiday memories alongside Santa and his helpers aboard the Magical Christmas Train, presented by the Sacramento RiverTrain. Come dressed in your Christmas morning pajamas for a 90-minute train ride through a winter wonderland, which includes cookies, hot chocolate in a souvenir mug, and a visit with Santa himself. For more information, train schedules and to purchase tickets, visit Sacramento RiverTrain. The Woodland Opera House presents the classic Christmas story “It’s A Wonderful Life” following the holiday misadventures of George Bailey, a small-town man from Bedford Falls. Showtimes vary throughout the month of December—visit the Woodland Opera House for more information and to purchase tickets. Join Dorothy and Toto for the Winters Theatre Company’s rendition of “Wizard of Oz,” running November through December at the Winters Community Center. To view performance dates and to purchase tickets, click here. For more information about the performance and the Winters Theatre Company, visit the Winters Theatre Company. For more events happening throughout the month of December check out the Visit Yolo calendar of events!